When I found out that the pub I often frequent was having a chili cook-off I was excited. When I found out it was on New Year’s Day I was alarmed. While I enjoy cooking, I was not ready to sacrifice any fun on New Year’s Eve for the sake of chili and counted on luck to wake up early enough on New Year’s Day to make a pot of award-winning-chili. After forgetting to set an alarm the previous evening, I woke up later than planned and was in no state to cook. With some moral support, one friend who opened cans of beans, and another who added enough spices to cover up the overwhelming amount of pumpkin puree I dumped in the chili, I managed to throw something together for the contest. Beyond participating in a chili cook-off on New Year’s Day, I made a few first-timer mistakes and would like to impart unto you my knowledge, so that you can actually win your next chili contest. 1. 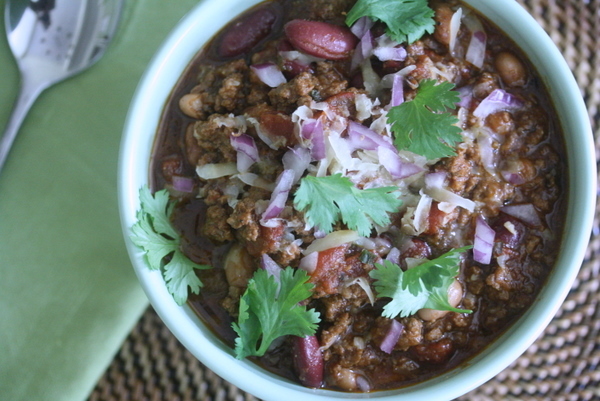 Give the chili a kick. Judges will only be consuming a bite or two of your chili, so make it stand out with a punch of flavor. An extra tablespoon of chili powder adds a classic kick, while my favorite chili spices are cumin and paprika. 2. Cook chili 12 to 18 hours in advance. If you under cook chili, the vegetables will still be crunchy and the spices won’t have time to marry. On the other hand, simmering chili in a slow cooker for 12 to 18 hours will yield tender meat (I promise, it won’t be dry!) and display all the vibrant chili flavors. 3. Avoid sweet chili. Not only may sweet chili be an unwanted surprise to those expecting a savory spoonful, but the sugar will overwhelm most other flavours in the pot. Two scenarios can lead to sweet chili: Either a) you want to add a twist (try something else. See tip #3); or b) your tomatoes have become sweet after having been left to simmer for a long period of time. To avoid the more common, latter scenario, use canned tomatoes and add salt as needed throughout cook time. 4. Make your chili unique. But don’t go overboard. Chili should still be comprised of spices, beans (I hold my ground on the beans), and vegetables. The chilis at the contest that voided one or all of these ingredients were not as well taken, while the chilis that added a cup of chorizo to the meat mix or used a fall-off-the-bone brisket were winners. 5. Use a tried and true recipe. Now is not the time to experiment with adding everything but the kitchen sink to a pot and seeing what happens. If you don’t have a go-to recipe, borrow Mom’s traditional chili and add some bacon, grab a few friends and use them as guinea pigs before the day of the contest, or use Phoebe’s unforgettable Chili Con Carne or BGSK’s Autumn Brisket & Pumpkin Chili. Alex Milling is a recent graduate of Northwestern and is hoping Chicago will make it through a whole winter with no snow (knock on wood).